We know dogs can brighten every day with their wagging tails, limitless excitement and slobbery kisses, and deserve the very best in exchange for their unwavering love. 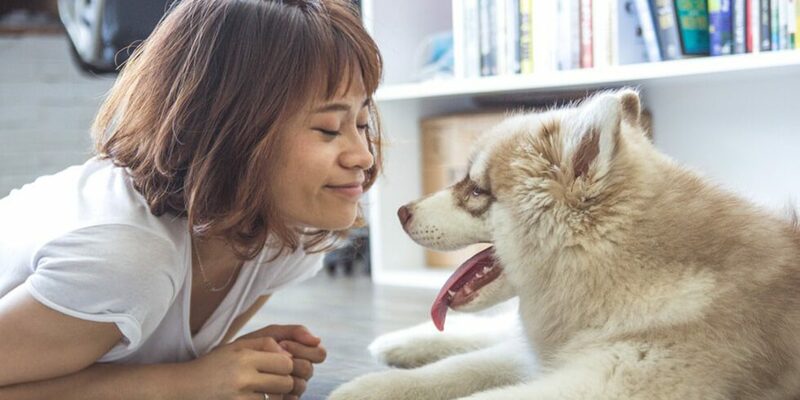 Here are some practical tips for making your home a safe, comfortable and happy environment for both people and canines. While you consider the size of a home, the layout of the kitchen and options for personalization, you should also keep your pets in mind. Elderly dogs will appreciate a single-story home, energetic breeds will love a spacious back yard and you might consider stain-resistant carpeting – or no carpeting at all. Shearwater offers all of these features and more, plus access to resort-style amenities that you and your dogs will love. Take your pup for a walk or bike ride along the 15 miles of trails, explore the neighborhood parks together, or even take them to Shearwater’s off-leash dog park, complete with an agility course. Just like kids, dogs appreciate a space of their own. Some homes at Shearwater have the option to include a Pet Room with a sink and washing station, or you could convert a mud room or entryway to include storage space for food, leashes and toys. If you prefer to keep your furniture fur-free, try providing a comfortable bed in the living room, so they have their very own spot to lounge and spend time with the family. Safety should be a number-one priority for all pet owners. Always consider the toxicity of plants when landscaping, and regularly inspect fences for holes and gaps. Inside the home, utilize childproof latches on cupboards of cleaning supplies, keep trashcans securely closed and be aware of what house plants are toxic to dogs. And if you have a chewer, make sure to store small parts and wires out of reach and provide appropriate chew toys for entertainment. Shearwater was thoughtfully designed to provide something for everyone, whether they have two legs or four. To learn more about the homes and lifestyle at Shearwater, join our Interest List or schedule a tour.